In conjunction with the opening of the AP boutique in Taipei last year, AP launched the Royal Oak Offshore Taipei 101 Limited Edition. Bookings for the watch started last year and the delivery of the watches is this year. The watch is a Limited Edition of 101 pieces and will feature 101 diamonds on the dial at the 10 o'clock position. The 10 o'clock hour marker has be stylized into 101. The rest of the hour markers will be in blue. The case back will carry the legend 'Taipei 101' and Limited Edition. The watch, cased in stainless steel with a diameter of 42 mm will be fitted with the AP in-house caliber 3126/3840. The caliber is a 59 jewels caliber beating at 21,600 a/h. The watch will be water resistant rated to 10 ATM. 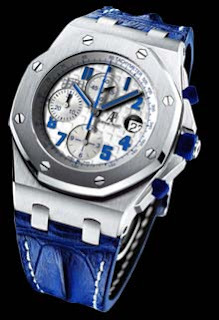 Initial reports states that the watch will be issued with a blue alligator strap. However, it seems that it will also be available with a white leather strap. The watch retails for NTD 798,000 or USD 24,600. Watches always adds personality. Luxury watches can be acquired at great prices if you know where to look. 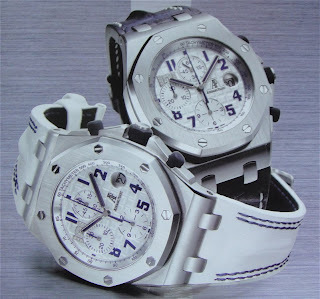 Look for a wide range of Audemars Piguet Watches at substantial discounts and you won't be disappointed. Welcome to the blog. I agree that you that watches can be acquired at great prices. So always shop around and compare prices. Welcome to the blog. Sadly no links to commercial sites.